Space: the final frontier .... The successor to the original Star Trek (1966), ST:TNG is set 78 years in the future, with a bigger, better Enterprise and a less volatile captain. It won 18 Emmys®, two Hugos, and a Peabody. Patrick Stewart stars as Captain Jean-Luc Picard, leading his crew to boldly go where no one has gone before. With Jonathan Frakes, LeVar Burton, Marina Sirtis, Brent Spiner, Michael Dorn, Gates McFadden, Majel Barrett, and Wil Wheaton. 178 episodes, 130 ½ hrs, 48 DVDs. All 176 episodes are included in this collection. 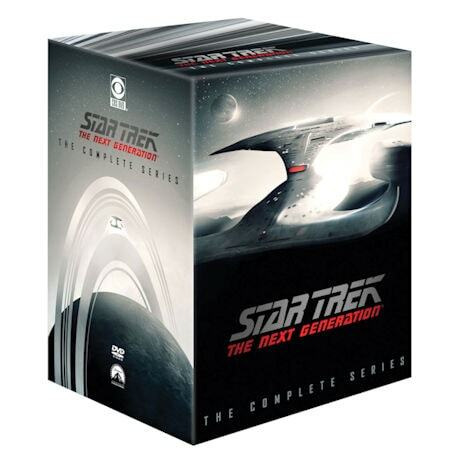 Star Trek: The Next Generation is the recipient of 60 industry award nominations including a Screen Actor's Guild Award Nomination, and 34 industry award wins including Primetime Emmy Awards and the prestigious Peabody Award.